First Peoples Economic Growth Fund Inc.
Click here to view the Winnipeg Free Press article from October 3, 2018. 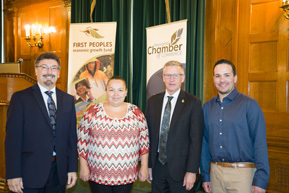 First Peoples Economic Growth Fund Inc. (FPEGF) is a not-for-profit organization with the mandate to provide financing to support Manitoba First Nation business proposals that are economically viable. The unique aspect of FPEGF is that it can provide a variety of support for First Nation owned businesses through a diverse portfolio of programs.